Ryanair had filed a compaint with the Dutch regulator ACM – Autoriteit Consument & Markt against AMS Airport. ACM has now ruled against Ryanair: “the tariffs and conditions at Schiphol 2018 are not abnormal”, ACM says. Ryanair complained they have not been contacted and they were not able to give their advise on the new tariffs, but ACM now says this is untrue. Ryanair also wanted a review of the Security Service Charge, claiming it was unfair (mainly because Ryanair has on average less suitcases p/p needing a safety scan). The Dutch ACM compared the AMS tariff to other airports, and ACM now says the tariff is not unfair nor discriminatory. Ryanair’s Irish pilots call for fifth strike day on 10 August, the same day as the Belgian and Swedish pilots, and possibly also the Dutch and German ones. Ryanair cancels 20 flights from Dublin on that date. Another kind of strike at Ryanair ...? The FR plane seems to be following the taxilane line. This runs about 18 meters from the edge of the concrete pavement, half the wingspan of a Code C aircraft. The 6m-wide asphalt pavement south of it is the wingtip clearance (min 4.50m required) to the red/white blast fence. The Fire Truck should have been using the service road that is further south of the blast fence. Maybe painting the Fire Truck in a conspicuous colour like red would have helped the pilots to identify the conflict and stop before the hit. Ryanair to meet with German union Ver.di in Dublin on 15 August 2018 to start pay talks for around 1,000 cabin crew members working in Germany. At the start of september all unions from all countries were FR operates under irish contracts (everywhere except the UK) will meet to coordinate a european spread action on the same day(s). This would be the biggest strike FR has ever experienced in its history. Dutch trade union VNV announces that negociations with Ryanair (= aimed to obtain Dutch labour contracts) have ended without agreement. Staff consultation to go on strike is set for 22nd August. Part of the "Always getting better" policy? Yes, but keep in mind that as they say in the ridiculous FAQ, there is a cap for 95 priority passes. So there is a chance that you might be "forced" to buy a checked bag if you don't do it early. So they found a way to officially charge for the carry-on luggage and they are trying to "brand" it differently. Indeed. 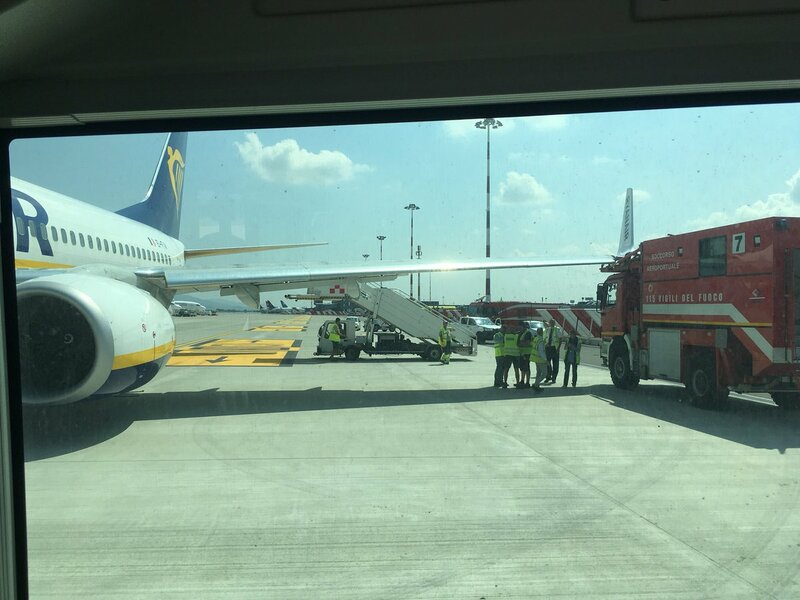 First Ryanair pushes all passengers to travel with just a trolley. And now that they're indeed doing this, Ryanair cashes in. And what if you are not one of those 95? Will you then have to pay the "gate bag fee" of 25 €? On top, the way they implement the new policy, is against Belgian consumer legislation. Passengers who have already booked a ticket, are entitled to the sales conditions they've signed for. The new bag policy will apply to all travel on/after 1 November. Non-priority customers who booked flights before 1 September (for travel after 1 Nov) can either add Priority Boarding for €/£8* or a 10kg bag for €/£10* or they may cancel their booking for a full refund. And what if you are not one of those 95? Will you then have to pay the "gate bag fee" of 25 €?. No then you pay 8€ for a 10kg bag and have to go to bagdrop before passing security. For once (just for once) I am tempted to say I am pleased by FR's decision. I think that historically, FR wanted as little checked in luggage as possible in order to save on ground handling. With time (a lot of time), they have come to the conclusion that the money saved on baggage handling was actually lost by longer boarding procedures and longer boarding of pax "tout court". Now, they are going to make money in a different way, but actually, it will be more comfortable for everyone, pax and cc. It will be interesting to see what legacy carriers that have introduced a "basic" fare "à la" ryanair to meet their competition will do now. if they are clever, they should do away with the "basic" no checked baggage fare and come back to a light fare including one piece of checked luggage. At least that's the way I see it. Right or wrong ? ...the way they implement the new policy, is against Belgian consumer legislation. Passengers who have already booked a ticket, are entitled to the sales conditions they've signed for. But TA knows them: "passengers won't be allowed to board when they don't pay, even when that's illegal". 1. Vredegerecht / Justice de paix comes free of charge. 2. TA might also initiate a class action on behalf of its members.